Towels are beautiful put together. Very absorbent. Also the color was exactly what I was looking for. Handwoven in Turkey from 100-percent Turkish cotton, these towels are available in a variety of colors that will enhance your bathroom decor. With the perfect combination of soft terry cotton and delicate ruffled pleats, these lovely towels create a warm and inviting atmosphere of cozy rustic charm. Each of these towels is made of machine washable material, so cleaning them is quick and easy. 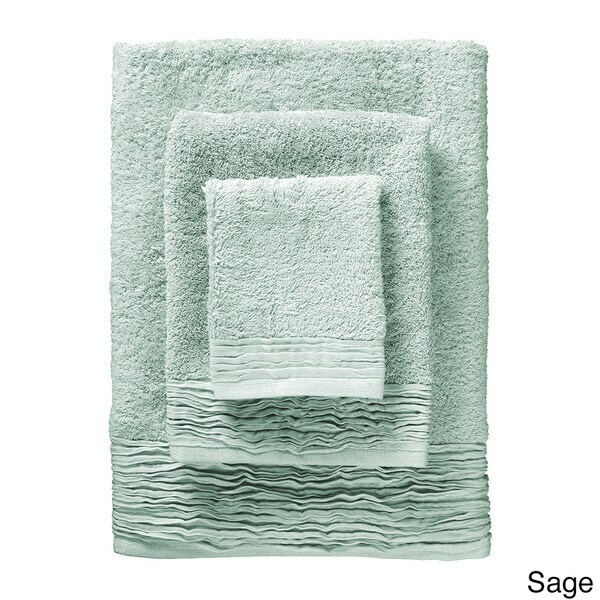 The set includes three sizes of towel, ensuring you have a piece for whatever job you need to do, and all three towels have a ruffled pattern along the edge that gives a slightly modern touch. I purchased these towels as decorative towels for my guest bath. They are exactly as pictured and great quality. I was surprised that the bath towel was so large. I'm very happy with my purchase. I purchased the green set and am happy with the soft color and the pleated feature. The price for the set is on the high end, but these towels are plush and wash up nicely. Once again I'm not happy with the color of a product. The color of the towels I ordered is listed as Lavender. When I received them they are a LIGHT Amethyst no like the picture. Will return them. These towels are very soft and the color is absolutely gorgeous! The quality was a little lower than I expected (some hanging threads/stitching on the bottom ruffled part) but for the price they are great. I love the towel set ! It goes very well with my bathroom decor ! These are amazing. Very soft & plush. "when will the lavender color be back in stock?" We hope to restock the lavender if it becomes available again. Unfortunately, we do not have a time frame and cannot guarantee it will be restocked. "Marine Blue is not shown. Any chance a can get a look at it? Will Sage be available again soon?" The "marine blue" is listed in the sixth image from the left. We will restock the sage if it becomes available again. Please check back with us periodically. Hoping it's high quality and will look great in the newly remodeled nantucketish bathroom. It's a pretty and an out of the ordinary set, and I need some green towels for the powder room. Hello sqep, These towels are beautiful! These GSM of these towels is 650. I hope this information helps. Thanks for shopping with us.